I’ve slowly been making a first pass at reading the Yoga Sutras and I’ve intentionally avoided blogging about it because I’m a young yogi who’s only three years old. Who wants to hear what a three-year old has to say about the interpretation of an ancient text??? But alas, I’m compelled to break my aversion because I came across something that relates to my last post. I’m not sure why more, and more coincidental things are popping up since I’ve started this blog but I’ll get to that in another post (maybe). What stands out to me is, “Accepting pain as help for purification” because when I think about “Missed Takes,” none of those are joyful moments. They’re humiliating, unpleasant, pain-in-the-arse times. Eureka! The pink-cloth, swathed man has a point! In all our “Missed Takes,” those experiences helped define a physical or emotional boundary for us. Maybe they brought us clarity on our personalities. Maybe we discovered something about the people around us in who brings out our best or worst. Maybe we realized we ignored our instincts and went with what the social majority (the outside) does/said. But the point is we burned through what we didn’t need anymore, what didn’t serve us, and moved closer to learning about our most authentic selves. In fact, suffering seems to be quite necessary in order to evolve because being in a blissful state doesn’t create the opportunity to progress. Delightful times are when we grow attached since they are comfortable and satisfying. Do we ever ask questions of ourselves and others when we’re happy? Uh – no. It’s a basic function of humanity that we require an agitated state before seeking something better. I’m not going to be welcoming more “Missed Takes” but I can see how they serve a purpose and for that I’ll be a little more thankful to burn, baby burn…I want to understand what my best and most authentic self is at its core. Entry filed under: Attachment, Beginnings, Creating Awareness, Yoga Sutras. 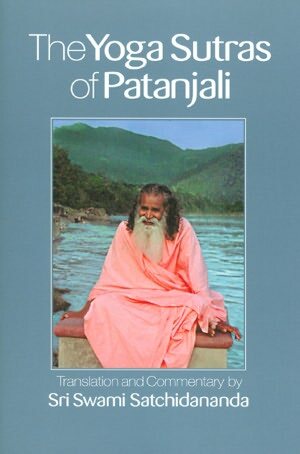 Tags: Attachment, Awareness, happiness, Lifestyle, Spirituality, Sri Swami Satchidananda, Suffering, Yoga, Yoga Sutras. Love this. Keep writing 🙂 It’s wonderful. Thanks for your great blog. Being “3 years-old” you do have some good wisdom! I agree that suffering is indeed necessary as “necessity is the mother of invention” and we seem to learn only when pushed past our comfort levels! This is my favorite book on the Sutras. Sri Swami Satchidananda makes it all so much more easy to understand and apply in our lives! fyi, he’s clothed in the peach/orange color of the traditional monastic robes of Hindu swamis. Wishing you peace, joy & enlightenment in Yoga!